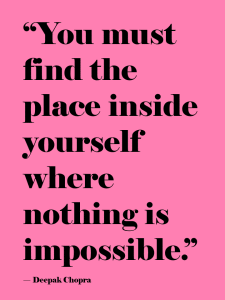 That place within myself where nothing is impossible…hmmm. When I felt so much joy that I could not adequately express it? Is that the place? Or when I experienced immeasurable pride and relief to have accomplished a very difficult task? Is that the place? So, if I just thought of those times more often…instead of the times when I felt defeated…would I be more powerful? I would became much more beautiful and strong just by going to those places in my thoughts? I could leverage more success and happiness by being more careful with my thoughts? Every unproductive thought I released made room for the impossible? Would I cancel the pity party and get on with it? Thank you Elisabet! Great day to you!